Hi Dad, As you remember from your visit here earlier this month we found some nice saucisson sec at the Mountain View farmer's market. Fabrique Délices was the purveyor of Chacuterie who also make a pretty solid pate. We had the truffle mousse I believe which you found to be pretty good. I'd say it's as good as any US made pate I've had but still doesn't beat those in France. I've found in the US that the only place to get great pate and saucisson is in fine restaurants who make it themselves. I'd love to get your take on the best brands and types of saucissons and pate we can find here in the US. In the world of chacuterie my favorites are goose mousse, duck liver mouse, pate de campagne, saucisson sec, duck rillettes, rabbit pate and of course fois gras. If you can suggest the best brands found in the US in each category I'd enjoy seeking them out to refresh my memories of summers in southern France. Salade Niçoise: Simple and Easy to Make This very colorful and inexpensive salad does not need to be authentic to constitute an ideal late summer one-course lunch. Stéphane, I’m sure that the tomatoes you find at these beautiful Mountain View or Los Altos farmer’s markets, that you are so lucky to have nearby all year long, must still be superb, sweet and juicy in early September. And I also guess that the time that you will be able to spend in your kitchen or outside at the barbecue to prepare meals will be limited for next few months. You even can forget about those olives and the anchovies that somebody close to you does not like and rename it the "deconstructed the summer vegetable and tuna salad"
So I would like to remind you of a simple to fix late summer lunch or early dinner dish that your mother and I have been very fond of since our student days in Aix-en-Provence: La Salade Niçoise. It is a meal in itself and with a few slices of a good baguette to mop the olive-oil based dressing, and perhaps a couple of pieces of goat cheese, your appetite will be satisfied. I just made a simplified version of this salad last week-end for our Sunday lunch after finding nice plump tomatoes and fresh small red potatoes at the Evanston Farmer’s market and, along with a bottle of Bandol Rosé, we enjoyed it a lot while our dining room table was still bathed in the sunlight peering through he leaves of the plane-tree in front of our building. I have to admit that the quality of the sunlight was unfortunately already pre-autumnal, something that always makes you mother a bit sad. But to get back to the salade niçoise and the way I prepare it; As you can guess its name derives from the city of NICE, on the French Riviera, close the Italian border. In this area that used to be Italian until it was reunited with France in 1860, the food has always been influenced heavily by its neighbor, the seafood found in the Mediterranean Sea, the olive oil harvested in its back country, and the plentiful sources of locally-grown vegetables and fruits. I’m referring to red and green peppers, white (coco), grey, broad, green, and small fava beans, all kinds of onions, tomatoes, baby purple artichokes, miniature zucchini and their blossoms, boletus mushrooms, purple asparagus, small potatoes, chard, purple garlic, and of course these famous anf flavorful tiny black ‘’niçoise’’ olives. And of course it is the area where the ‘’mesclun’’ of various types of lettuce and greens was born. But some people (Patricia Wells among them) think that this type of blend has its origin in nearby Italian Liguria. As well as lemons, clementines, black currant, peaches, etc. They are several dozens of recipes for making a salade niçoise, and I am not even sure that a single one can qualify as authentically ‘’niçoise’’. I checked in several books of recipes from both Provence and the Côte d’Azur, the area between St. Tropez and the Italian Border, and the only thing I can say for sure is that originally in NICE this salad consisted of only RAW vegetables. You would never find potatoes, or vinegar in it. And the old Niçois NEVER MIXED tuna and anchovies; it was either one or the other. The only cooked ingredient was the hard-boiled eggs. The raw vegetables used were: Twice salted seeded, drained, and then quartered tomatoes, thinly sliced red and green peppers, small purple baby artichoke hearts, some hearts of celery, tiny fresh fava beans, young spring green onions, small black olives, and that’s it. Later they added some slice of cucumbers and a mesclun of lettuce and green herbs like parsley, chervil, and chives. Some chopped fresh basil could sometimes be added at the end. Now, another point of contention is the type of beans that you use. In most French restaurant nowadays a salade niçoise include cooked small green beans. That is what I use. But in the ‘’authentic salade niçoise ‘’ only raw fresh small green fava beans, called ‘’fevettes’’ there, or ‘’coco’’ (fresh white) beans coming from pale green pods, were used. As far as onions are concerned, most people use very finely sliced small red or white onions as a garnish. But in the real niçoise you should use ‘’cébettes’’, very young spring green onions whose white bulbs are very small. They look a bit like very small leeks, and over here their counterparts would be scallions. I personally use thin slices of red or torpedo onions in the summer. Now as far as choosing the kind of flaked tuna you will put in the middle of the serving dish, it should always be CANNED TUNA, and if possible Italian canned tuna packed in olive oil. Never seared fresh tuna like too many American restaurants have taken the habit to do since the early 80`s under the influence of the new Californian Cuisine. If you use anchovies, instead of tuna or in addition to tuna like most French restaurant do, use flat canned unsalted Italian or Portuguese anchovies packed in olive oil. Not the Danish or Norwegian type. Now, as far as the dressing is concerned: In the original Salade Niçoise, they seasoned the various raw vegetables with salt and pepper, and doused the sliced boiled eggs and the vegetables with a good quality extra-virgin French olive oil. No vinegar was used. But nowadays most restaurants, as well as me, pour some vinaigrette on it before serving. See my own way of preparing a vinaigrette down below. Lastly, never mix your Nicoise Salad in a salad bowl, like you would do with another lettuce-based salad. Serve it on an oval porcelain or ceramic platter where it is much easier and prettier to assemble the various components. The platter should be rubbed with one clove of freshly peeled garlic. Also use only black olives and not green olives to garnish the salad. Preparing the vinaigrette: In a large bowl put 2 Tbsp of Dijon mustard at room temperature, Add some salt and black pepper to taste. Wisk 2Tbsp of red wine vinegar in the mustard until you obtain a smooth mix Slowly incorporate, while whisking all the time, 1/3 of a cup of Extra-Virgin olive oil. Continue to whisk until all the ingredients are emulsified into a smooth sauce without letting the vinegar separate from the oil. PASTIS, the perfect summer drink This successor to absinthe has been France's favorite apéritif since the mid 50's. It has a long and sometimes difficult past. I was talking about a cult. However, that particular religion’s followers belong to separate churches: The RICARD congregation, the PASTIS 51 parish, the CASANIS denomination, the old BERGER BLANC sect, the JANOT true believers, the new apostles of BARDOIN or BOYER, to mention some of the better known brands. Me? I do not drink much pastis too often anymore for 2 reasons: 1. It contains licorice that is not recommended to people who have to watch their blood pressure. 2. It has become too expensive an aperitif for my modest financial means. But when I drank pastis several times a month in the seventies and early eighties, you could find a bottle of Ricard for 13 dollars in Chicago. And I would buy full-liter bottles on Air France on my way back to Chicago for 40 francs until the early nineties. Nowadays, you have to spend between 28 and 30 dollars at large liquor stores like Binny’s or Sam’s for the same bottle of Ricard. It has become a luxury item and I’m afraid that the Euro-dollar exchange rate is not going to make it cheaper in the coming months. Too bad. Your question gave me a furious envy of pastis, especially since we are going through a hot period here in Chicago in late August. But as far as my brand preferences go, I would say that when I was living in Nîmes in 1959-1960, I was a fanatic believer in CASANIS, a brand created by a gentleman named Casabianca in the late forties. It was based on green anis instead of the star anise (called “badiane” in the South of France) used by most of its competitors. It is a very good pastis, usually a little cheaper than RICARD and PASTIS 51, but that you rarely find North of Valence. As a matter of fact I have never seen that brand of pastis served in bars and brasseries in Paris. But when I went to study at the university of Aix-en-Provence in 1960, I switched to RICARD, a brand that was much more common than CASANIS in the cafés where I went. I tried PASTIS 51, made by the old company PERNOD, but I did not like it as much. And for the last 15 years , when I occasionally drink a pastis I order the marvelously aromatic and natural-tasting pastis made by HENRI BARDOIN at the Distilleries de Provence in Forcalquier, in the Alpes de Haute Provence. This latecomer, launched in 1990, is made from a blend of 50 different plants and spices, most of them harvested in Provence or near the Mediterranean Sea. 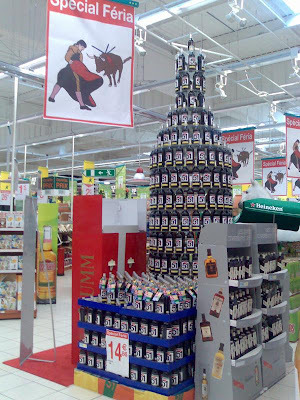 In France it is more expensive that the traditional commercial brands. But surprisingly, in Chicago, you can purchase a bottle (slightly smaller than its competitors I have to admit) for around $ 27.99 or $ 29.99. at SAM’s or BINNY’s. Its taste is much more distinctive and its flavors more complex than its competitors. By the way, RICARD and PASTIS 51 do not reveal their ingredients, especially what aromatic components and possibly mixed compounds they add, besides the anis, fennel and licorice. It is one of the factors that led me to switch to HENRI BARDOIN that I find has a very natural favor Another good brand is JEAN BOYER, a very elaborate pastis, without any sugar added, made from 72 various plants and 6 spices in a religious community in Fatima. It is the most expensive pastis that money can buy I France. But I do not think that it is exported to the USA. I used to like pastis JANOT, made in Aubagne, the capital of those so pretty Christmas figurines: The Santons. But I did not see any in bars for many years. Two cheaper brands are DUVAL and PRADO 45 . You can find PRADO in some liquor stores like Binny’s where it sells for 10 dollars less than RICARD. It is O.K. but not as good. I cannot stand PERNOD, that has an almost chemical taste and whose anis taste is almost bitter. 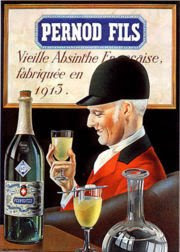 PERNOD FILS was the most popular brand of absinthe, the ancestor of pastis, before 1915. That brand was created in PONTARLIER, in the French JURA mountains that are at the border between France and the French-speaking part of Switzerland. In fact it was a Swiss gentleman named HENRI LOUIS PERNOD. At the end of the 18th century a doctor from Neuchatel, PIERRE ORDINAIRE, concocted the original recipe of ABSINTHE made of a distilled drink based on wormwood spirit mixed with green anis, hyssop, melissa and chamomille. Another Swiss man, named DUBIED, built the first absinthe distillery in COUVET, Switzerland using Ordinaire’s recipe. Later DUBIED partnered with his son in law, HENRI LOUIS PERNOD, and they built a second one on the other side of the French border precisely in Pontarlier. It became so popular that many other French distilleries started to produce absinthe. In 1830, the French troops sent to French colonies in North Africa, started to mix some absinthe in their water to protect themselves from all kind of medical problems. And of course they loved it so much that when they came back home they talked a lot about the benefit of this 68% strong alcoholic beverage, that became instantly popular, especially after 1865 when French wine producers suffered a lot from a massive attack of the phylloxera parasite that damaged a lot of vineyards and reduced by 75% the consumption of wine. At the end of the 19th century, the French were consuming annually more than 13 million liters of absinthe. That is when several French scientists started to do experiments on the effects of wormwood on both the nervous system and the social behavior of heavy absinthe drinkers, and concluded that it could provoke all kinds of possible dangerous side effects, including hallucinations (something that that was never proven). At the outbreak of WORLD WAR I the French government banned all drinks whose alcoholic content was above 16 %. And in 1915 efforts by various temperance and political lobbies obtained a complete ban of absinthe. This is when Pernod opened a distillery in Spain. But it never gained the success that it had in France and Northern Europe and closed after World War II. So they went back to France and started to produce an anis-based alcoholic drink. But is only in the late twenties that a young salesman from Marseille by the name of PAUL RICARD started the actual commercialization of an anis-based aperitif under his own name. He had to fight a lot until 1932 to obtain through a lot of political lobbying and after paying many taxes and fees, the right to legally sell the first PASTIS de MARSEILLE. It became even more popular during the period of massive social reforms voted by the “Front Populaire” in 1936, that legalized the “congés payés’’ (vacation time paid by employers), to be ranked the No1 favorite ‘‘apéritif’’ in France. Especially after the government granted Paul Ricard in 1938 the right to raise the alcoholic content of his pastis from 40 to 45 degrees... But, once again, the Vichy government of Maréchal Pétain at the beginning of World War II banned the use of any drink whose alcoholic content was above 16 %. We had to wait until 1951 to be able again to drink legally our favorite apéritif. Eventually the two major brands, RICARD merged with its competitor PERNOD to form in the nineties one of the world leaders in the field of spirits and wines. “Pastis” is a provencal word, a diminutive form of “pastisson”, meaning “mix or blend” as well as, figuratively, “a mess”. In the beginning, the production of Pastis was concentrated in Southern France, and more particularly in a region between Marseille and Avignon. 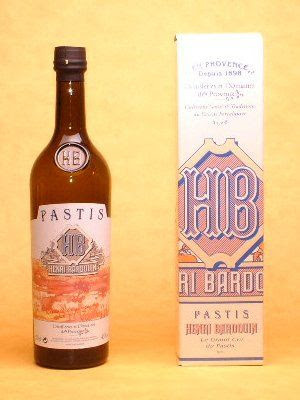 Pastis had more or less the same anis-licorice-herbal taste as absinthe, but did not contain the so called “dangerous” wormwood. But contrary to many beliefs, more pastis is consumed in Northern France than in the South. The right way to drink pastis: In a tall narrow conic-shaped glass, pour one part of pastis, then slowly add ice-cold water (five parts) from a pitcher containing water and ice cubes, but do not add ice cubes in the glass. If you really want to do it the right way but also use ice cubes: Pour the water first, then add the pastis and observe the beautiful visual effect of the golden-yellow liquor giving progressively to the the water an opaline-like cloudy slightly greenish hue. Then add a couple (but no more) ice cubes. If you drink 1 part pastis, with 3 parts water in a small cylindrical glass it is called ‘’ une mominette’’, that in some bars in France they call ‘’ un petit jaune’’. I you add some mint syrup to the pastis it is called a ‘’perroquet’’, with pomegranate syrup it becomes ‘’une tomate’’, and with orgeat (almond-flavored) syrup ‘’une mauresque’’. Drink slowly, with slightly salted almonds, pistachios, olives, and possibly some slices of mountain ham. A ta santé. This is a story that will interest you Stéphane, as an alumnus of the University of Wisconsin in Madison, with a particular fondness for the state of birth of your mother. MIMI, in her always interesting stories relating the lives and cooking habits of her French ancestors in Wisconsin posted on her “très sympathique’’ blog ‘’French Kitchen in America’’, often talked about their old neighborhood of Frenchtown. It always tickled my curiosity, and every time I asked myself where exactly was that mysterious ‘’Frenchtown’’ located? My impression was that MIMI’s Frenchtown was perhaps located somewhere between Green Bay and Marinette on Lake Michigan, perhaps Oconto, since she alludes to fishermen and seagulls. I had found a Frenchtown in Michigan on Lake Erie, near Monroe, and several roads and neighborhoods named Frenchtown in areas like Eau Claire, Prairie du Chien, and Withee, Wisconsin. But I could not locate any place close to Lake Michigan or to fishing grounds. So I decided to find out how many Frenchtowns I could find in the Midwest and more specifically in Wisconsin, and if they actually had been populated by French people from France, or by French-speaking Canadians or Belgians, as it is often the case in Wisconsin. Searching for reliable historical sources, I first consulted ‘’ The Time Of The French In The Heart Of America’’ , a very good book published in 1996 by Charles Balesi, a former French teacher and historian from Chicago. It contained interesting pieces of info on French explorations and military expeditions in Illinois, Iowa, and Wisconsin. But they did not mention any Frenchtown. Then, as I was browsing through a website of the University of Wisconsin at Green Bay, I found a very interesting project sponsored by a group of professors of French that studied 400 years of connections between Wisconsin and French-speaking countries. That report, “Wisconsin French Connections" was published in 1999, to mark the 150th anniversary of that state in 1998. It is useful to remember that it is a Frenchman from Normandy, Jean Nicolet, who landed in a canoe near the site that is now Green Bay with a small group of Hurons in 1634, coming from Quebec. He was in fact searching a passage to the ocean that would allow him to sail to China. He was also acting in an unofficial capacity as sort of an ambassador trying to establish in the name of France good relations and commercial partnerships with the local Indian tribes. He met with Native Americans members of the Winnebago tribe, along the Menoninee River, that first he thought were Chinese people. He engaged into a good relationship with them. In these days the French called Green Bay the “Baie des Puants” (the stinking bay) . Reading this report I was very excited to learn that there was an area, located in what was called Montrose Township in Dane County, near Belleville, that was actually called Frenchtown because it was populated by French people who came from France between 1850 and 1870. What fascinated me the most is that they were all coming from the same region in France, the Département of Haute-Saône, in the region of Franche-Comté. That district located about 240 miles southeast of Paris, is situated southwest of the Vosges Mountains and Alsace, and 30 miles northwest of the Swiss border. More precisely most of them came from the tiny town of Saint-Germain, north of the city of Lure, and from other villages nearby. It just happened by coincidence that my good friend Georges Cuisance (Kiki) the owner of KIKI’S BISTRO, my favorite eatery in Chicago, is precisely from Vesoul, the major city in Haute-Saône, that is less than 20 miles due southwest from Lure. You can read Kiki`s story in an interview on this blog. Why and how did so many French people of the same region ended-up settling in such a rural area of Wisconsin? The reason for that migration of French people from the same area to create such an important “ethnic”concentration so far away from their home base is very unusual since the French in these days did not expatriate themselves so massively, especially to the United-States. But in fact the explanation to this quite unique phenomenon is simple. The first Frenchman from Saint-Germain who came to Montrose was named Jean Roi. By the time he arrived in Belleville he already had anglicized in name into John Roy. Before settling there in 1850, he had lived in the upper New York state since 1835 and had fought as an enlisted soldier in the Mexican war until 1848. According to Jerry Remy, the local ‘’historian’’ of Belleville, who is a direct descendent of the original French first settlers, Roy was probably given a ‘’land grant’’ when he was discharged, and perhaps was persuaded by another soldier to travel West to Belleville to purchase a piece of land from one of the early American settlers who lived in the Belleville area and were always eager to sell their property to go farther West. These early settlers in Belleville were not German, Swiss, Norwegian, Scotch or Irish like most of the other settlers in the surroundings towns of Dane County and Montrose township , but rather ‘’Yankees’’ from Ohio, Pennsylvania, New England, and New York state, and a couple of Kentuckians. In fact the gentleman who founded the city of Belleville in 1851 was an English-speaking Canadian, Mr. Frederick, who gave to the new town the name of the city in Ontario he came from, Belleville. And the man who put Montrose Township on the map in 1840 was one John Kendrick, from Kentucky, who named Montrose after a town in Pennsylvania. The founder of Paoli also came from Pennsylvania. Roy, whose wife who joined him later was also from Canada, was so happy to live on a small piece of land where he cultivated hops a few miles northeast of Belleville that he wrote to his former neighbors in Saint-Germain to tell them how easy and cheap to buy good-size parcels of agricultural land in this area. That is how the immigration of whole families from the region of Saint Germain to Belleville started to reach a total of 32 families before it ended around 1870. Many of them probably benefited directly or indirectly from those land grants attributed to ‘’Yankee’’ families who has settled in Montrose Township that allowed them to purchase land that they sold later to the new French settlers. Some of the ‘’Haut-Saônois’’ families to follow Roy’s bear names like Tisserand, Garvoille, Remy, Genin, Tourdot, François, Carteron, Viney, Pernot, Gehin, Henry, Frelin, Menigoz, Faivre, Lamboley, Laroque, Carteret, Dubay, Pillar, Germain, Clerget, Leclerc, Petitot, Carteron, Grillot, Durand, Perrin, Begey, Grosjean, Fleury, Gerard, and many others. The majority of the new French settlers were poor, but honest hard-working people. They had a great sense of what their community should be in order to survive and prosper, and they helped each other toward that common goal. Before they came to Wisconsin, they had difficult lives, trying to survive from farming a few acres on land disseminated in small parcels in and around Saint-Germain. In their early years in Frenchtown they lived in very simple log houses deprived of any kind of basic comfort. Their clothes were of the same simple kind that they wore in France and they walked in wooden ‘’sabots’’ (galoshes). Their way of life and day- to- day habits and routines in those days were very modest and frugal. They relaxed from their hard labor regimen with lots of singing. They also were devout Catholics and had many children, that they either brought with them or who were born and raised in Frenchtown. Some of these French families counted up to 10 or even 12 children. They knew how to plant, grow, and harvest barley, oats, and hops, and to process small grains. And what I was amazed to learn about, and that fact was confirmed by Jerry Remy, is that they brought from France their native habit of drinking wine, even though the Haute-Saône area is not a wine-growing region. So they planted vineyards at the edge of some of their farm’s back plots and harvested substantial amount of grapes, mostly Concord, that they transformed into wine. Jerry Remy told me that not only his ancestors produced wagon-loads of grapes, but that his great grandfather drank a glass of his own wine every morning for breakfast. And his grandpa must also have been a strong man since he died at the age of 103 in Frenchtown in 1965 after having lived there for 100 years. He arrived to Belleville from Saint-Germain in 1865. Perhaps the red wine produced on his family farm had helped him to maintain his coronaries in good condition. I do not know if, when in the 1860s some bad insect infestation ruined lots of wheat and other cereal crops in Southern Wisconsin, those French farmers started to raise dairy cows, beef cattle, sheep, and poultry like many of their Swiss, German, Scandinavian, and American neighbors did. A very interesting historic map of Montrose Township dated 1899 shows the different land properties belonging to French settlers with their names clearly marked. The early French settlers did not speak English of course, but got along well enough to be accepted by the other ethnic groups of Montrose Township and the city of Belleville. The French that they spoke at home was not ‘’high French’’ but rather a regional ‘’patois’’. Much later the new generation of children and grandchildren of the early settlers born in Frenchtown, who had married among themselves, became English-speaking Americans but some of them continued for a while to speak their original patois at home. A few descendants of some of these families are still living in the Belleville area: Several members of the Remy family are listed on Remy Road in Belleville and the name of Francis (François) can also be found in a few places. But nowadays the few direct descendants from these early French settlers still living around Belleville do not speak French, or have a very limited knowledge of it, according to what Jerry Remy told me. Where exactly was Frenchtown? How to get to its cemetery? The name of Frenchtown referred to a five-square-mile area northeast about 3 miles northeast of Belleville where Jean Roy started his farm, and where all the other families from Haute-Saône settled and bought pieces of land as large as 80 to 100 acres. Three of the early French immigrants, Olympe Genin, Auguste François et Xavier Garvoille (whose name was changed to Gavoille) were forced to serve in the army during the civil war. Their tombs are in the French cemetery on Frenchtown Road. Some local historians have estimated that the 32 original French families had so many children (sometimes 10 to 12 ) that around 1902 the size of the French settlement, Frenchtown, had expanded to 400 or even 500 souls, according to an article written by August Roden in the State Journal, published in Madison in 1902. By that time the new generation spoke English. This is why many of the more recent headstones in the Frenchtown cemetery, that used to be called Saint Raphael cemetery in its early years, bear many English first names, even though the last names are the same as those of their elders. Some original names were anglicized many years later. For example, François became Francis. The French town cemetery’s early name of Saint-Raphael referred to the catholic church of Saint-Raphael that was erected in 1869 near Paoli, a charming little village a few miles north of Frenchtown, that welcomed catholic parishioners from the French and Irish nearby communities. Saint-Raphael was replaced by a larger church in 1900 in Paoli and was renamed Saint William. The early French settlers to die in Frenchtown were initially buried in the Belleville cemetery, along with mostly protestant folks. But in 1870, 20 years after the arrival of Jean Roi, one of the settlers gave a parcel of land to the Frenchtown community to be used as a catholic French cemetery that would be blessed and dedicated by a catholic prelate. The cemetery was formally organized in 1925. And the few people who had been buried in the Belleville cemetery were exhumed and buried again in Fenchtown cemetery. It is a well-groomed and peaceful place with beautiful trees on a slightly hilly meadow bordered on side by a dense forest and on the Frenchtown Road side by cornfields. To get there from Belleville drive North on Highway 69 for 2 miles, then turn right on the very pretty Frenchtown Road and drive east for 1 mile. The cemetery is clearly marked and cannot be missed since it is directly on the right side of the road. Several markers explain the history of both the settlement and the cemetery. During the 10 days we spent in California last month, both at your house and in the Sonoma County wine district, your mother and I drank several very interesting Californian reds, and I have to admit that some of the Rhône-type wines produced in the Dry Creek district are sometimes as satisfying as the “real thing” from Vaucluse. But,as it is the case everytime we travel to California, when I come back home, I cannot wait to uncork a bottle of Bordeaux, or anything good coming from the Southwest of France. It just happened that 2 days after our return to Chicago, I attended a very interesting wine tasting at one of my favorite wine stores in the Chicago area , The BOTTLE SHOP, in Wilmette, IL, whose very astute and decently priced selection of wines from all over the world, is organized by type of varietals. The Bottle Shop always offers some very original and not often found wines from lesser-known producing areas from France. Joe Alter, the shop’s very competent wine director is always happy to guide his regular customers in selecting one that would please their palate without damaging their wallet too much. A couple of weks ago he suggested a very cheap (under 8 dollars) Tempranillo-based Spanish red (if my memory is correct from Navarra) that proved to be the perfect comapnion to a roasted duck breast that evening. The white MONTRAVEL had been a registered AOC for several years. But strangely enough these very good wines are not only relatively rarely found on American wine stores, but also not even widely distributed in France where they are under-estimated and under-rated by professional wine critics. Vincent Ehret, from FINE VINES in Melrose Park, IL, the regional importer of HAUT -SARTHES, came with the owner of that estate, the very knowledgeable and charming Monsieur Daniel Hecquet, a well-known oenologist who was very instrumental in obtaining the AOC label for the red wines of the MONTRAVEL appellation. Monsieur Hecquet owns and manages CHATEAU PUY-SERVAIN in the MONTRAVEL and HAUT-MONTRAVEL areas, a medium size property where tthe HAUT-SARTHES wines are produced. I had tasted their very fragrant (perfect for summer picnics) HAUT-SARTHES BERGERAC ROSE, several times before this wine-tasting where it was served along the other dry white MONTRAVEL and sweet HAUT- MONTRAVEL, and it has become one of my favorites rosés when I have lunch at KIKI’S BISTRO, on Franklin St. in Chicago, my most pleasant unwinding event of the week every Friday. I also love to drink it as an ''apéritif'', before dinner while I am cooking a leg of lamb and ratatouille. I also think that the HAUT-SARTHES BERGERAC ROUGE 2005 (60% Merlot, 20% Cabernet Sauvignon and 20% Cabernet Franc exclusively from high-density plantation, hillside, estate vineyards) is as good if not better than many small Bordeaux. This dark-colored but well-balanced and soft wine with good body and good fruit is very satisfying with a wide spectrum of earthy bistro dishes, including lamb stew with black olives, boeuf Bourguignon, and veal stew Marengo. It is a very comforting wine on a cold winter day in Chicago. Mr. Hecquet conducted the ‘’degustation’’ of his wines in very good English with a lot of very precise comments reflecting both his enormous technical and practical knowledge of wines and his obvious pleasure to talk about them, since he is very proud of his own production. Creating new approaches and improving the methods for planting and harvesting, as well as the process of vinification per se, to obtain very remarquable wines reflecting the intrinsinc qualities of their terroir and the integrity of their winegrowers and winemakers have been his passion and quasi-obsessionnal objective during his whole life. A life that he spent, since he was a child learning to plant vines, in the vineyards and some famous chateaux of the Bordelais and Bergerac areas (Yquem and Figeac among them). The man is totally immersed in his passion for the defense of good and traditional wine-making in the Bordeaux and Bergerac zones of production, and was at the avant-garde of the legal fight to obtain a new and less ambiguous classification of ‘’crus bourgeois’’ that should better reflect the actual value of some of these Bordeaux wines. The 2003 classification was annuled in court in 2007. The new one should be published in 2009. As I said, Monsieur Hecquet is not only a château owner, but also an oenologist who, for several years, was involved in various expert or executive capacities in trade associations and unions as well as technical and legisalative committees, working very hard to defend the rights of serious owners to make decent wines of good character without interference or pressures from official, political, or trade organizations. At the end of his studies towards a degree in oenology at the Oenology Institute in Bordeaux he wrote a well-received study while doing his internship at the famous Château d’Yquem, the best-known of the great Sauternes wines. The 3 MONTRAVEL appellations belong to the same family and region as the BERGERAC wines, an area in the département of DORDOGNE, whose AOC was recognized in 1936, located about 50 miles East of Bordeaux. The wine-producing area of MONTRAVEL, that is comprised of 14 ''communes’’ (townships), is located at the extreme Western end of the BERGERAC area (called Bergeracois) and of the Dordogne departement and many of its vineyards are on small hills that are bathing in the sun while exposed to the sweet and humid influence of the nearby Atlantic ocean. MONTRAVEL is truly the best wine-growing district of the BERGERAC appellation, and it deserves its own recognition. At the end of these vineyards, if you drive a few miles West, you are within a few minutes at the heart of the COTES DE CASTILLON and COTES DE FRANCS, and a few more miles farther you enter the SAINT EMILION district. 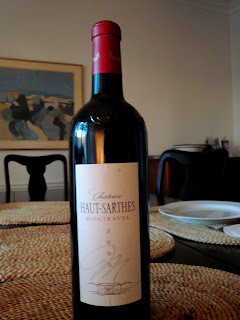 HAUT-SARTHES MONTRAVEL ROUGE is in fact, like a Saint Emilion, made of 70% or 80% of Merlot, and 20 to 30% of Cabernet Franc (sometimes called ‘’Bouchet’’ in the Bordeaux region). That results in a perfect mix of fruit, fragrance, roundness and structure, like you would find in a good St. Emilion. And the tannins are so well integrated that they add a marvelous complexity to the wine. But for such a great and well balanced wine, you will pay much less than what you would pay for a St.Emilion Grand Cru offfering the same qualities of elegance and richness. Two vintages are available, the 2003 that is very intense and aromatic, with notes of ripe berries, and provides a very long finish, and the 2005, that offers a nice balance of fruit and acidity, with a great nose, and has a very pleasant (still a bit short to my taste- the wine could have been decanted that night, but was not) finish. It is ready and easy to drink now but its great terroir qualities should improve even more from a few years in the cellar. The 2004, a vintage that proved to be much better than initially thought, had some cabernet sauvignon (10%) in it. But it is not available over here. I was very impressed by both vintages and would strongly recommend it with any kind of beef stew or duck-based dishes like ‘’confit de canard’’, or perhaps even a Cassoulet. The 2005 is sold for $25.00 a bottle at The Bottle Shop in Wilmette. It is available in a few other stores in the Chicago area. What is an authentic French brasserie? After a downturn in the nineties, brasseries are gaining a new popularity in France. They constitute a new trend on the American restaurant scene. Your comments on the great dinner we had last month at the very good “Old Town Brasserie” in Chicago, as well as your doubts that this restaurant is typical of a French brasserie were right on target, Stéphane. As you correctly noted in your post that restaurant, although a very good one, was not at all a typical brasserie neither in terms of decor and ambience or of the type of food served in a French brasserie. It is too fancy, the atmosphere is a bit too cozy, and the composition and presentation of the dishes are closer to what you would find on your plate in a 2 Michelin-star restaurant than in a brasserie. But we should not be surprised knowing the enormous and proven talent of its executive chef Roland Liccioni, who, as you rightly mentioned, authored so many marvelous dishes at both Carlos and Le Français in suburban Highland Park and Wheeling and more recently in Chicago at Les Nomades. It has become trendy over the last 10 years in several large American cities (like New York, Washington, Las Vegas, Los Angeles, San Francisco, Miami, Atlanta and Philadelphia) to try and recreate French brasseries. But quite often they are either too fancy, to "Americanized" , too sophisticated or too eclectic in the formulation of their menus to qualify as real brasseries. I am thinking of places like Daniel Boulud Brasserie in Las Vegas, Brasserie Ruhlman in N.Y.C and Chicago, “ Mon Ami Gabi” in Chicago and Las Vegas, Brasserie Perrier in Philadelphia, or French-American brasserie in Atlanta You told me that you were not very excited about “ Left Bank” in your own area of Silicon Valley. But I have to admit that the menus of the Left Bank restaurants that I read on their web sites do look a bit similar to the menus that you would find in a brasserie in France. Also, I've not been there but it seems to me, again from visiting their websites and reading comments on Gayot, that Balthazar, in New York , and the Brasseries Les Halles in NYC, Washington and Miami are probably, in terms of menus, wine lists, decor, and continuous service from morning to evening, the closest you can find to the real thing. In the early eighties, Un Grand Café in Lincoln Park in Chicago, where we used to celebrate your birthday for several years, had a decor and an atmosphere that in some way tried to imitate those of a French brasserie or “grand cafe”, with its leather banquettes, and racks for hats and umbrelllas, as well as hanging newspapers. And a few of its dishes, like pâté de canard, leek terrine, duck confit, moules marinières, oysters, steak-frites, grilled salmon, and roasted chicken, were of the same type that you would find in any French brasserie. For the last 13 years Brasserie Joe has been the closest to the real thing you will find in Chicago. No wonder: its menu that includes the most traditional French brasserie dish, “choucroute garnie” (sauerkraut cooked with white wine, and served with various sausages, salted pork, ham, and boiled potatoes) was created by the famous chef Jean Joho (Everest in Chicago, The Eiffel Tower in Las Vegas, Brasserie Jo in Boston ) who was born, educated, and trained as a chef in Alsace, where the first brasseries started. He was a sous-chef at the celebrated Auberge de l’Ill, in Illhaeusern, a temple of haute-cuisne and one of the best restaurants of Europe, whose founder Paul Haeberlin passed away a few weeks ago. But as you also noted, none of these American restaurants,except for Les Halles and Balthazar serve food all-day and that peculiarity disqualify them as true brasseries. From what I read, I have the feeling that the new Haussman Brasserie, that just opened a few days ago in Northfield, even though it is the creation of Jacky Pluton, a French chef with a long experience, will not ressemble a traditional French brasserie either and that it’s menu is designed to please a typical Northwest suburb-type of client base. So what is a real French brasserie? First of all, let me remind you that that word means “brewery”, a place where “brasseurs” (brewers) brew beer. And by extension it became before the French revolution, a place where you could drink beer. The main regions of beer production have been Alsace, and Lorraine, in the Northeastern part of France near the German and Swiss border, and in the North near Belgium and Luxembourg. Paris was also a zone of production. No wonder then that the first large brasseries at the end of the 19th century in Paris were created by wealthy Alsatians, many of them not very eager to become German after their native province was once again taken over by the Germans at the end of the Franco-Prussian war of 1870. They emigrated to Paris and launched with an enormous amount of success, this new type of restaurants that served Alsatian specialties as well as fish, steaks, and good desserts. Their names became synonymous of brasserie: Wepler (a large brasserie on Place Clichy, still famous nowadays for its seafood and shellfish), Dreher (closed), Runtz (rue Favart in the 2nd), Zimmer (beautiful recently redecorated brasserie on the Place du Chatelet), Zeyer (still very popular, Place d’Alesia in the 14th arrondissement), Bofinger Place de la Bastille (with its spectacular art deco glass dome), Flo (with its very impressive art-nouveau decor in a picturesque alley in the 10th arrondissement) Lipp in Saint-Germain des Prés, where generations of politicians, celebrities, and just regular French and Foreign tourists are still flooding the place to eat a relatively mediocre choucroute, marinated herrings with potatoe salad, stuffed pig trottters, and drink their famous but not that great beer. Lipp is typically one of these places where you go to see people and be seen, or because you are on a nostalgia trip. It is nevertheless a great place to visit at least once in your life, but if the Maitre D’ does not recognize you you will have to show some clout or inventive cleverness, or to be with a very well-dressed companion to be seated downstairs. Other famous brasseries were started (and are still in operation in 2008) by French businessmen from other regions, principally Auvergne. La Coupole, the largest and to me the most beautiful of Parisian brasseries, was open on Boulevard Montparnasse in 1927, and completely redecorated to its original splendor in 1997. So many famous artists, writers, musicians, draw sketches. wrote pages or scores, did some wild partying there that you could create a museum with all the memories and photos attached to this lively place. The food is O.K. but nothing to write home about. Le Dôme, the other “grande dame” of Boulevard Montaparnasse, well known for its seafood and shellfish. But since it is very expensive I prefer it’s smaller sister-brasserie Le Bistrot du Dôme, in nearby rue Delambre. L’Européen next to the Gare De Lyon train station. Impressive room, but I believe that nowadays the food is just O.K. Charlot Roi des Coquillages (well-known for its shellfish) on Place Clichy. I never ate there. La Brasserie Lorraine (an overpriced and over-rated fancy restaurant Place des Ternes in the 8th), Chez Jenny in the 3rd, Julien in the 10th, (used to be good but I believe it is no longer the case although the decor is still spectacular) La Closerie des Lilas in the 5th (a very charming restaurant and bar that welcomed a wole world of famous artists and writers, including Hemingway). Thoumieux, rue Saint-Dominique in the 7th is a traditional meeting place, with lots of wood and a comfy decor. But I was told by some friends that the quality of the cuisine is not what it used to be. Also Brasserie Balzar in the 5th where I used to drink beer and eat croque-monsieur and wieners when I was a student at la Sorbonne. It is still one of my favorites and when I used to go there often in the early sixties was at the time owned by Brasserie Lipp, of which it was sort of a more democratic replica. Later on, it was taken over by the FLO group in the nineties. but is still a pleasant place. The FLO Group,(200 restaurants in the world) recently acquired by a Belgian equity company, owns and manage some of the best known brasseries in Paris and in several cities: Brasserie Flo, Bofinger, Julie, La Coupole, Le Boeuf sur le toit, Le Vaudeville, Terminus Nord, Balzar, Brasserie du Théatre, Les Beaux-arts, Brasseries Flo in Nancy, Metz, Reims, Nancy, and Barcelona. I love Brasserie Flo-L’Excelsior in Nancy, and had a few decent choucroutes over the years at Bofinger, Flo, and Terminus Nord. Another, but less important restaurant group, also sold recently to a financial company, is Les Frères Blanc, that owns Le Procope, Charlot Roi des Coquillages, and La Fermette Marbeuf, near the Champs-Elysées. I have not eaten in any of these for years. Au Chien qui Fume in the old Les Halles district , remains one of my favorites. They have fixed price menus offering a good quality-price ratio Vagenende, a beautifully appointed old brasserie on Boulevard Saint-Germain, a couple of blocks from Rue de Seine, where you spent the first 6 months of your life, is a perennial favorite of American tourists. The food can be very good, especially during the winter months, or quite mediocre during the tourist season from June to September. So is Le Grand Colbert Rue Vivienne near la Bourse, in part because of the famous restaurant scene between Diane Keaton and Jack Nicholson in “Someting’s Gotta Give”. I never ate there, but I love the environment of that place. And they have an attractive menu In the same district two other brasseries have their strong regular supporters: Gallopin and Le Vaudeville, but I never ate at Vaudeville and I’ve never been too impressed by the food at Gallopin. La brasserie of Hôtel Lutetia in the 6th, at the heart of one of the best fashion district (ready-to-wear) is very pleasant for lunch and is usually full of very elegant people. The menu is a bit more refined than in most brasseries. Terminus Nord, a great but expensive brasserie in front of the Gare du Nord train station is a favorite of travelers who want to have lunch or dinner before boarding the Eurostar train to London. Very good shellfish and foie gras. Chez Georges, Boulevard Pereire, in the 17th . I used to love this place and they had a superb “pâté en croûte’’ and a very good “gratin Dauphinois”. But let's not ignore the many more modest cafés-brasseries in various neighboroods of Paris, like my dear Café de la Tour Eiffel rue du Commerce in the 15th, where we ate last summer. There, you can order typical “mets de brasserie” (brasserie dishes) for less money than you would spend in the above-mentioned “grandes brasseries”. Of course most major cities in the French provinces have their own famous brasseries. Some of my favorites are: La brasserie Excelsior-Flo in Nancy, whose decor is an architectural landmark. La Cigale , that you can see in “Lola”, the beautiful film by Jacques Demy shot in the early sixties, in Nantes. La Brasserie André in Lille. La Brasserie Georges in Lyon. And of course Le Boulingrin in Reims (where we had lunch last summer),and its great Art-Déco decor. What are the main differences between a restaurant and a brasserie? Contrary to most restaurants and bistrots that are closed at least 2 days per week, and sometimes closed for lunch on Saturday, brasseries are open 7 days a week and, except for a few that are not serving food between 2:00 and 6:00 PM, usually offer continuous service from breakfast time to late at night. In Paris several well-known brasseries like La Coupole, Brasserie Lipp, or Le Grand Colbert,serve dinner until 1:00 AM. Most brasseries are open 365 days a year. In provincial cities brasseries are often located and concentrated around busy point of passage like a railroad station, city hall, post office, main church, or more generally speaking on the main drag of the town. Their lighting is usually much brighter, and the sound level higher, than in regular restaurants and bistrots. Sometimes, especially in old-fashioned brasseries, the waiters still don a long white apron, a black jacket, and a black tie. In newer brasseries their attire is more contemporary but always include a white dress shirt with a black tie and a black or white waiter jacket. The brasseries have a less extensive and less expensive wine list than in traditional restaurants. But they often offer interesting regional wines in carafes or by the glass that you don’t find in regular restaurants. In most brasseries, you do not need a reservation, (not true anymore for the most famous ones in Paris) but sometimes you have to wait for a table. Not all brasseries have bars, but some have a counter where you can grab a sanwich and drink a glass of wine while reading your paper. Contrary to most restaurants, you can show up at any time and order a simple dish, or sandwich, and a glass of wine, beer, mineral water, a coke or a coffee, without having the waiter making a face at you... It is not uncommun to see people ordering only an omelette, a croque-monsieur (grilled sandwich of ham, cheese and bechamel sauce), or a hot dog with fries, or a simple ice-cream with a coffee at 11:00 AM, 3:00 PM, or 11:00 at night. But sometimes you can also observe whole families, usually visiting from some province, having a full lunch in the middle of the week, starting with oysters, foie gras, mussels marinière, melon and prosciutto, or smoked salmon. This would be followed by a chateaubriand (a thick piece of filet of beef) with béarnaise sauce, or a “steak tartare’’ (freshly knife-chopped raw beef mixed with a Worcester sauce, chopped shallots, capers, lemmon juice, finely chopped parsley, and a raw egg yolk), or an andouillette A.A.A.A.A. (chitterlings sausage), or sauteed veal liver, or a filet of Dover sole meunière (in a light butter sauce), or veal kidneys in a mustard sauce. The desserts would often consist of poire Belle Hélène, mousse au chocolat, crème brulée, fruit tart, or sorbet. Some members of the family might also order cheese before or instead of dessert. Like restaurants brasseries generally offer a couple of plats du jour (specials) that can run from coquelet au Riesling (cornish hen in an Alsatian Riesling wine sauce), carré or gigot d’agneau aux flageolets (leg or rack of lamb with beans), or Cassolette de Coquilles Saint-Jacques (baked scallops in butter and wine reduction). But usually the selection is less sophisticated than in regular restaurants. In Brasseries, dishes are most of the time traditional and do not require long cooking time and elaborate preparation. The average brasserie customer wants to have a tasty but relatively fast lunch or dinner. Me, I love to have a slow leisurely lunch in a brasserie with friends, eating some of my favorite dishes: Pâté en croûte, terrine de lapin, or poireaux vinaigrette, followed by confit de canard et pommes sarladaises or bavette aux échalottes, and cantal cheese as a dessert. All of this washed down with a good bottle of a small Bordeaux or a carafe of a good regional vin de pays, red of course. Bon appétit. Premier Mai (May Day), la Fête du Travail, in France and in Chicago. Today, May 1, 2008, many immigrants will organize parades in the streets of Chicago to focus the attention of the public on their various problems in this country. But very few people know that this day is in fact celebrated all over the world as “Labor Day” , an international workers holiday, and that it has its (tragic) origin in some events that took place in Chicago between May 1 and May 4, 1886. Every year on the first day of May I feel very nostalgic of the way the “Fête du Travail’’ (Labor Day) was celebrated in France in the fifties where it was one of the most joyous national holiday. I enjoyed watching the marches and parades organized by the major labor unions in the large cities with its colorful banners and loud slogans, the traditional bountiful picnics or lunches with friends, and sometimes the music and dances on public squares. And of course it was also a celebration of Spring with the tiny bouquets of muguet (Lilies of the Valley) that you would buy from street vendors for a few francs, and that men and boys would offer to their girlfriends, mothers or favorite female teachers. Some years the muguet was scarce and expensive, but most often its powerful fragrance would overpower the living room of the house or the bar room of the neighborhood café-restaurant. It was really a day of popular joy and good humor, even in socio-political environments not too fond of any left-wing connotations, or very remote from workers rights and demands, and it was even observed in conservative and bourgeois families who read the Figaro rather than L’Humanité. Of course I remember the food that was simple but flavorful: Deviled eggs (oeufs durs mayonnaise), quiches, omelettes aux fines herbes ou au lard (omelettes with parsley and chives or with bits of fried bacon), cornets de frites (french fries), poulet rôti et jardinière de légumes ( roasted chicken with fresh spring peas, baby carrots and pearl onions), and sometimes when they were already available, fraises au sucre avec de la crème Chantilly (fresh strawberries sprinkled with powdered sugar with whipped cream). At the end of the day lots of young people had initiated their first serious amorous, or just flirtatious connection, and many were not walking that straight after a few too many glasses of pastis or rosé wine. In those days the Premier Mai’s workers parades were rather good-humored, rather than charged with hard political chants and slogans, except during periods of strikes or social discontent when they became a perfect occasion to remind the population and the government of their “revendications” (demands), protests, and rights. But I am ready to bet that if you had asked any marching worker what was the origin of the Premier Mai or the Fête du Travail, very few would have been able to say that it was a commemoration of some tragic events that took place in Chicago on May 1, 1886. On that date workers, including members of unions, socialists, a few anarchists, and more generally members of organizations demanding reforms, got together to launch a national movement towards obtaining an eight hours working day. Following several days of marching in various streets Thirty five thousands workers walked off their plants, workshops and stores, joined by many thousands more the following days, calling other workers to go on strike. There were several rough contacts with the police, some including shooting episodes. The most serious of them occurred on May 3 at the Mc McCormick plant (the famous farm implement manufacturer) that had been on strike for a while when policemen shot 2 or 3 striking workers. This provoked more violence and some anarchists called for revenge at a protest meeting that they had organized at the Haymarket square on Randolph Street. Initially that meeting that took place on DesPlaines St, half a block north of Randolph, was rather calm, under the watch of the police department. But an encouragement to civil disobedience by one of the speakers motivated a police force of 176 men to march into the crowd and try to disperse the meeting. Someone threw a bomb that killed a police officer and that event prompted the police to open fire in every directions, killing and wounding many people. Sixty police officers were wounded and eight killed. The Haymarket episode was regarded by big business owners as a proof that the workers movement was infiltrated by radicals and anarchists that threatened the future of the American enterprise system. The mayor of the city banned all meetings and marches. Any kind of picketing was immediately dispersed by police. The local press published very tough articles against anarchists and foreigners accused by the police of being responsible for all the trouble. In spite of hundred of arrests, the Chicago Police Department never found the person who had thrown the bomb. But this conspiracy theory that everything was caused by anarchists and foreigners did nothing to calm things down. In 1887 eight anarchists were arrested and found guilty by a biased judge and preconditioned jury. Half of them were hanged, one committed suicide in jail, 3 were eventually pardoned by the Governor of Illinois in 1893. The involvement of these men in the events of May 1886 was never proved. Do not expect miracles; But, to my taste, some offer better value in that price range than their Chilean, Californian, or Australian competitors. I’m glad you asked me that question Stéphane since in recent months I have been tasting a few of them and I intended to write about my findings on this blog. As you know, even though I have been advocating for years the good value offered by red wines from my native Languedoc, like Costières de Nimes, Corbières, Côteaux du Languedoc, or Minervois, since it is probably the area of France where wine growers and producers have accomplished the most obvious progress in vinification, I still have a deep loyalty to small red Bordeaux. And since this terribly long and depressing winter we had this year in Chicago forced me too often to limit my outdoor activities, I used that occasion to often cook French ‘’comfort food’’ type of dishes on week-ends. So, with simple ‘’cuisine bourgeoise’’ dishes like Fricassée de Poulet (chicken) aux Champignons (mushrooms), Veau Marengo (veal stew), Sauté d’Agneau (lamb) aux Tomates et aux Olives, Boeuf (beef) aux carottes, Gibelotte de Lapin (rabbit), or Filet Mignon de Porc (pork tenderloin) au Thym et à la Moutarde, there was no doubt in my mind that small Bordeaux would be ideal pairs for this kind of food. (now bought by Binny's in 2010). I have to say right away that I found much better deals at Binny’s than at Sam’s, where I could spot only 3 Bordeaux in that price range. So I ended up buying most bottles at Binny’s. I tested 20 Bordeaux, but only 8 of them were, to my taste, interesting enough to be listed here. (see list below). And as usual, I checked a couple of cheap Bordeaux at Trader Joe’s and I selected one of them in this list. I was a bit apprehensive to start with, since a few months before I started this particular search I had bought a few remaining 2003 small Bordeaux and I found their merits sometimes inconsistent, even though I have to admit that some were very good. I was hoping to find some good 2004, a year that has been a bit underrated and that produced some very decent Bordeaux sold at very reasonable prices. In fact I think that 2004 might prove to be a very interesting vintage. But for some reasons 80 % of the wines I found on the shelves of these 2 retailers were already 2005’s. Now, everybody is claiming the charms of this vintage and some say it might prove as good if not even better than the 1982, 1990, or 2000, in red Bordeaux. Some writers even used, once again, the famous ‘’vintage of the century’’ superlative, which in my opinion is a bit far fetched now. The weather was so warm and dry during the growing season that the grapes, a bit smaller than usual, were very mature at harvest time, but with a high ratio of skin to juice, resulting in wines with a high level of concentration. It also meant a higher level of tannins, especially in the Cabernet-Sauvignons. Fortunately nights were cooler for a few weeks before harvest time, allowing to keep enough acidity in those grapes for good balance. So I think that for the great wines from the Médoc or the Graves, it will be a good idea to wait a few years before we can have a precise idea of the level of greatness of the 2005 vintage. I would like to point out however that nowadays, Bordeaux growers who have been suffering from the competition of ‘’New World’’ wine makers, mainly from Australia, Chile, and the United States, are sometimes trying to imitate them. These “New world” wine makers were successful in their effort to please the taste of the new generation of younger wine drinkers, especially in Europe and in the U.S., who enjoy softer, fruit-forward but too often jammy for my taste, easy to drink mellow red wines. So some Bordeaux wine growers have started to vinify their wines to satisfy this new demand. They now offer wines that do not need long cellaring, can be drunk young, have softer tannins, and unfortunately have much less originality and ‘’terroir’’ personality that their predecessors. To me it is a bit of a shame that not only a few Bordeaux start to taste like their Australian or American Merlots or Cabs counterparts, with no real balance (too much fruit and not enough acidity), but also that so many French liquor and wine groups, have invested massively in these new world countries to produce there what is becoming a large chunk of their main competition in their own turf. However, a few small independent ‘’propriétaires-viticulteurs’’ (small vineyards owners) have continued to make more traditional Bordeaux, with a good fruit-to acidity ratio, some nice tannic properties, and a minimum of body and structure. They do not try to systematically produce soft, immediately pleasing wines, that do not require any effort to appreciate. They still believe in the merits of their own soil and weather, a minimum of aging, often in small oak barrels, and in their own inherent ability to create a balanced blend of Merlot, Cabernet-Sauvignon, Cabernet Franc, perhaps a bit of Petit-Verdot or Malbec (a grape that seems to come back in fashion these days, after its success in Argentina). That is the kind of ‘’petits Bordeaux’’ that I was looking for. They are usually simply labeled as ‘’Bordeaux’’. If you are very lucky, you can sometimes find a Bordeaux Supérieur, and even less often a Côtes de Bourg or Côtes de Blaye, ‘’on sale’’, in that price category. But I have to admit that you cannot expect them to compare to a Médoc, a Saint-Emilion or a Graves. The finish of many of them is a bit short. You will not jump out of your chair in ecstasy after the first gulp...and chances are that most of these wines will benefit from a few minutes of oxygen. In any case: Long life to these brave small producers... And let’s enjoy these wines that are neither for the elitists, snobs, sophisticated “foodies”, or fashionistas, but simply for people who enjoy well-made wines with character and personality. And believe me, dollar for dollar they provide more clean satisfaction and pleasure than some of their presently popular competitors. Here are a few small Bordeaux that I found in Chicago which in my opinion are decently made. Most of them can be drunk now. The numbering corresponds to my own preferences in decreasing order after only one tasting. 1. CHATEAU COMBRAY Bordeaux 2005 Produced by Ginestet, Bordeaux, a large old distribution house that owns vineyards and has its own winemakers to blend wines. Imported by Glazers, Dallas Distributed locally by Chicago Wine Merchants 7.99 dollars at Binny’s Gold Medal at the Concours General Agricole, Paris 2006 Merlot 70% Cabernet Sauvignon 20% Cabernet Franc 20% Seductive dark ruby color Pleasant nose, slightly smoky Good balance fruit-acidity Relatively soft tannins Some body . Rather dry structure. Notes of ripe black cherry and black currant Decent but finish is a bit short Altogether a nice little wine that will please the more “traditional” palates, as well as the more “contemporary” American wine drinker. 2. CHATEAU LESTRILLE Bordeaux Supérieur 2003 Estelle Roumage, viticultrice (wine grower) Imported by Fine Vines, Melrose Park, IL 8.99 dollars at Binny’s (The 2005 to come out now will be a bit more expensive and will be a bit over this present price range) 100% Merlot Great nose Good body and structure Very smooth tannins Good fruit but well balanced. Notes of cherry A touch of leather Very nice finish A very pleasant wine that will satisfy young American drinkers. 3. CHATEAU ROLAND LA GARDE Premières Côtes de Blaye 2005 Produced by Bruno Martin in a legendary castle where Roland, Charlemagne’s favorite Knight who was killed while passing the Pyrenees Mountains. 9.99 dollars at Binny’s Hand harvested 67% Merlot 33% Cabernet Sauvignon Aged in new French Oak barrels Very rich dark color Pleasant earthy nose with notes of dark cherry and a touch of coffee Rather tannic but no harshness Some elegance that should develop with age Still a bit thin in terms of structure and complexity but full bodied Nice finish Obviously the result of good vinification, this wine is already quite drinkable but it should improve considerably in a couple of years . 5. CHATEAU NODEAU Côtes de Bourg 2005 Vignobles De Pardieu 7.99 dollars at Binny’s Essentially Merlot. Very good feeling of ‘’terroir’’ Tannins are rather masculine but relatively soft Some notes of berries A ‘’real’’ Côtes de Bourg’’ Will certainly mellow a bit over the next 2 years, but quite drinkable now. A very pleasant, well balanced, round wine with soft tannins. Some other low-priced Bordeaux wines that I tasted, but that for one reason or another did not seduced me enough to prompt me to go back to the store to buy a second bottle. However they are quite drinkable. What a treat, when they are made the right way. But lots of doubts still exist about the “French” origin of their American cousins, the so-called “French fries”. Ah Stéphane... your question a few weeks ago about your difficulty to find good ‘’fries’’ in the Bay Area that would be as good as those ‘’ frites’’ that you eat in French restaurants brought back many fond images and memories into my poor half-frozen (from our Chicago very cold winter) brain. As a matter of fact it is true that nowadays it is not that easy to find very good ‘’frites”, made the traditional way, in American restaurants. Most of them use frozen fries, which does not mean that they cannot generate decent fries. As a matter of fact, it is also the case in most French restaurants. Speaking of fries sold by street vendors: When I was about 12 year-old, my mother decided that it was time for me to learn how to defend myself since I was the subject of too frequent attacks by bullies at school who enjoyed kicking and punching my, at the time relatively frail, body for various reasons. So she sent me to take judo lessons 2 times a week after classes from an older man, who had a ‘’black belt’’ ranking in that sport. He lived in an apartment about 20 minutes walking from our house in Reims. I detested those lessons, but... if I had a few coins in my pocket , I bought myself a nice treat on my way back home. After I left the man’s place I had to cross a bridge over some railroad tracks, Le Pont de Laon. I would run on the bridge knowing that at the end of it was TOTO FRITES’place. It was one of these small trailers, much smaller than their pizza counterparts in French southern villages, where a gruff man, Toto, who was always smoking a cigarette and whose nails were as black as a piece of coal, was cutting, washing, drying and frying potatoes that were very greasy, but incredibly tasty. In fact even Today they still rate in my memory among the best I ever ate in my life. This type of mini-trailer which was in fact stuck for good on jacks and no longer had wheels, was called a ‘’baraque à frites’’, and every town in Northern and North-East France had many of them. Toto’s baraque was poorly lit by a kerosene lamp, whose fumes added to the marvelous odor of the bubbling ‘’friture’’ that you could smell 300 yards away. Toto served his beauties in a paper cone made from pages from the local newspaper, ‘’l’Union’’, and after I added more salt from the big tin shaker available on the counter, I would eat them as fast as I could before the grease would run through the newsprint. Boy, were they good. Sort of thicker-cut that the average ‘’frites’’ that we ate when we went to the carnival on the nearby ‘’Place du Boulingrin’’, but much tastier. My mother who once discovered my secret when I came to the dinner table with my mouth still shiny from the grease, yelled at me for eating such bad food, and explained to me that they were probably fried in a mixture of cheap animal fats, like ‘’saindoux’’ (lard), beef fat or suet, and perhaps horse fat. In any case it was not good for me, even though in 1952 the word Cholesterol was nowhere to be found in the Larousse dictionary. My father, who was born in Northern France near the Belgian border from a Belgian father, and who lived part of his adolescence in Antwerp, loved ‘’pommes frites’’ like all Belgians do. He would come to my defense and argued with l my mother that if she would prepare ‘’frites’’ more often I would not have to buy cheap and poor quality ones from dirty street vendors. He also told us that whenever he was in that neighborhood near the Pont de Laon he would himself have a ‘’cornet de frites ’’ chez Toto. Just thinking about it make me drool and I can hear in my head the marvelous song ‘’ Un cornet de frites’’ that Yves Montand sang so nicely in the early fifties. Anyways. My mother made some beautiful pan-sautéed potatoes, but the rare times when she accepted to make ‘’frites’’, they were of a very different style: light, crunchy, good but not greasy enough for me . My nutrition-conscious mother would fry them in a traditional black metal fryer in either ‘’Vegetaline’’, the equivalent of Crisco, or ‘’huile d’arachide’’ (peanut oil), like they have been done in most French restaurants and families since 1947. Peanut oil in those days was produced in some French African colonies, and was not as expensive as it is now, especially in the U.S. Nevertheless, after the actual frying was done, she would let the fat cool down and somewhat solidify at the top if it was Vegetaline, which allowed the ‘’graillons’’, these tiny particles of burnt fat and potatoes, to get up to the surface and to be removed easily. Then she would cover the fryer and it would stay that way in the pantry until the next ‘’friture’’. Personally I use peanut oil when making ‘’pommes de terre sautées’’ at home. But your mother's delicious "frites" are in fact "fausses frites" since, once she has cut hem with a knife, she put them in a bowl containing and mix them well in a mix of 3 Tb of Greek olive oil and garlic salt. Once they are well impregnated but not soaking wet, she lay them on a baking sheet and bake them in the oven, at 425 degrees , for about 20-25 minutes, turning them over once. 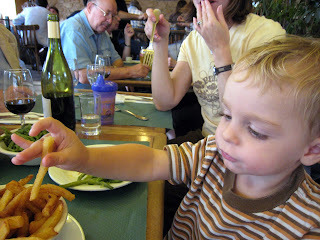 The other great frites of my youth were found at ‘’ Chez Francis’’, a French brasserie that was on the opposite sidewalk of my grand-parents building on the Boulevard James Fazy in Geneva, Switzerland. They were served ‘’à volonté’’ (as much as you could eat), as a vegetable accompaniment to their marvelous ‘’entrecôtes’’ (rib-eye steaks). Between 1950 and 1970, I probably ate thousands of these golden-hued thin ‘’pommes-frites’’ that were never greasy, slightly crispy outside and soft inside as they should be, and always kept hot on their tin plate that was put on a small ‘’meta’’ burning dish-warmer in the middle of the table. Some years later in Paris, in the mid-sixties, I found the same kind of perfect ‘’frites’’ at L’Entrecôte, Rue de Verneuil in the 7th arrondissement. It was the same formula as Chez Francis in Geneva, with the same ‘’frites à volonté’’ placed on their dish-warmer. I do not think that the original Parisian ‘’Entrecôte’’ still exist in 2007, or it has probably changed ownership many times. But I thought it was reborn in America when some summers ago, your mother and I had a delightful steak with ‘’frites à volonté’’ in San Francisco. The restaurant was called ‘’Café de Paris L’Entrecôte’’, on Union St., and the fries were almost as good as at the original "Entrecote" restaurant in Paris. But I learned that in fact their model was in Geneva, Switzerland, and that they had an exclusive right to use the original recipe for the famous butter sauce of the entrecôte that was created in 1941 at the Cafe de Paris... in Geneva precisely. During my last year of college, in Paris, the famished and poor student that I was at the time in 1963 used to go to '' Les Palmiers", Rue des Halles at the heart of what was then ‘’Les Halles’’, the huge and lively vegetable, fruit, and meat central market of Paris, just north of la Place du Chatelet. There I would eat enormous "saucisse de Toulouse" (pork sausage) sandwiches with ‘’pommes-frites’’. The frites would be placed above the sausage inside the open piece of fresh baguette. It was greasy but delicious and comforting after an evening spent working on a philosophy essay due the next morning at La Sorbonne. In Northern France, this very popular type of sandwich is called "Un Américain Saucisse''. In recent years, when I was craving for traditional “pommes frites” I would go to La Biche Au Bois, Avenue Ledru-Rollin, near the Gare de Lyon in the 12th arrondissement. And if I did not have the time to go that far from my regular Paris home-base in the 15th arrondissement, I would be happy with a side order of frites with my ‘’Salade Auvergnate ‘’ (that includes country ham, and Cantal cheese) at my local regular neighborhood café-restaurant ‘’ A la Tour Eiffel’’, Rue du Commerce in the 15th. (see ‘’My French Gourmet Vacation’’ on this blog for details). And I have a pleasant memory of the frites at ‘’ Le Chien qui fume’’ in the old Les Halles district. I haven't gone there in years , but I understand that the ‘’pommes frites’’ at the good old Bouillon Chartier, an old- style restaurant for employees of the nearby businesses Rue du Faubourg Montmartre in the 9th are still good. Most old-fashioned "brasseries" and large " traditional bistrots" like Chez Georges and Gallopin in the 2nd arrondissement, Terminus Nord and Brasserie Flo, in the 10th , La Coupole in the 14th, Thoumieux in the 7th, Balzar and La Closerie des Lilas in the 5th, La Rotisserie d'en Face in the 6th, Le Ballon des Ternes and another Chez Georges in the 17th, Le Boeuf Couronné in the 19th, used to have very decent fries. But I cannot garantee that it is still the case in 2008. In Chicago, when I arrived in January of 1970, my favorite fries were served with a very good hamburger at the long defunct Brief Encounter, a small but very clean and pleasant store-front diner in the 360 North Michigan building. They were thin-cut but always well fried and not soggy. But the best ‘’pommes frites’’ I ever tasted were at Le Bastille restaurant that unfortunately closed its doors forever in the mid-eighties. You will find here below a list of some restaurants that still offer good ‘’pommes frites’’, made the right way that I will explain later. So, what exactly are real ‘’ Pommes de Terre Frites’’ and where do they come from? Real ‘’pommes frites’’ should be called "pommes de terre frites" (fried potatoes) are pieces of potatoes cut in elongated sticks about 1 cm thick from a relatively large tuber with a high level of solid dry matter like a Bintje in Europe, or a Russet from Idaho or Wisconsin in the U.S. Once they are cut, with a butcher knife or a special fries cutter, in a very consistent length and thickness, the fries are washed in cold water for a few minutes to remove as much starch as possible from their surface. Then they are dried thoroughly in a cloth or paper towels. They are pre-cooked (a little more than blanched) in a bath of frying oil, like peanut oil, at a temperature of around 328 degrees F or 165 degrees C for 6 or 7 minutes. Then they are removed to a strainer. The final frying is done for about 5 minutes once the oil temperature reaches 356 degrees F or 180 degrees C. When they are nicely colored, they should be removed from the fryer and immediately drained and blotted on several layers of paper towels. Then they are salted and served very hot. If they are eaten while they are still hot, they will remain crusty outside and soft inside and will be light, not greasy, and easier to digest, since the moisture will not have the time to come out from inside the potatoes through steam and make them slightly soggy and greasier. Most food historians agree on the fact that the idea of frying the potatoes in two successive baths of fat, comes originally from Belgium. And most connoisseurs still think that the best Belgian fries are fried in animal fat. But there is still a big controversy between the French and the Belgians about the real origin of the ‘’pommes frites’’. According to the ‘’Belges’’, in the early part of the 18th century relatively poor people living on the banks of the Meuse River, in cities like Namur, Huy or Dinant, used to fish small fishes in the Meuse River and deep-fry them to complement their meager food supplies. But when the river got frozen, they had the idea of cutting pieces of potatoes imitating the shape of fishes and to fry them. So were born the first pommes frites. And since small fishes were called ‘’fretin’’ in this French speaking part of the Belgian Netherlands, some people even think that the word ‘’frites’’ may in fact be an adulterated version of ‘’fretin’’. It seems a little far-fetched to me. What we know for a fact is that many French ‘’proscrits’’, citizens who had been banned in France after 1850 and the political coup d’état by Louis Napoleon, who had fled and started a new life in Brussels, as well as political refugees, including several chefs, in 1870, popularized the fries in Belgium. The many ‘’friteries’’, eateries devoted to fried potatoes, that you find in Belgium would be in fact a French import. The French date the origin of the pommes-frites back to the time of the French Revolution of 1789, just 3 years after Parmentier started to promote the virtues of the potato that most French people were not really interested in eating at that time, when their Spanish neighbors had been consuming them since the end of the 16th Century, and the Belgians since the end of the 17th century. But several years of bad wheat harvests, and periods of real famine, between 1785 and 1788, contributed to put the ‘’pomme de terre’’ on most French dinner tables. In fact the largest part of the potatoes grown in Europe until the 18th century were given as food to farm animals. In 1789, a man whose name I could not find started to sell fried potatoes under the famous Pont Neuf over the Seine river, located at the west-end of the Ile de la Cité. It became an instant success and those fries became known as ‘’Pommes Pont-Neuf’’. Nowadays, many traditional French restaurants and brasseries still call their ‘’pommes frites’’ ‘‘pommes Pont-Neuf’’. ‘’Pommes pailles” are “shoestring potatoes”. They are cut with a mandoline and fried in a single bath. “Pommes allumettes” are thin-cut fries known as “Matchstick potatoes”. They are cut with a knife and fried in two baths. Most French people, especially from the older generations, and that includes me, like to eat their ''frites'' au naturel, meaning as is. Some younger French people love to use ketchup or even mayonaise, like they do in Belgium. In Northern France, and even in some small ''friteries'' in Paris, lots of fries lovers enjoy a splash of vinegar on them. Now, let's clarify a few points about the origins of the so-called French Fries in the U.S. When some American political opinion-makers decided to punish the French for condemning the U.S intervention in Iraq in 2003 by renaming French Fries Freedom Fries, I had a good laugh. Obviously, most of these pundits ignored the fact that the term French does not refer to our country, but to a special way to cut vegetables in sticks, or in a julienne fashion, called ‘’frenching’’. This same culinary term is also used in the U.K to define the trimming the fat from lamb chops when used to form a rack of lamb. But this origin is disputed by some food historians who claim that in fact the use of ‘’French’’ actually relates to the French origin of these fries. Some note that Thomas Jefferson discovered them when he was the U.S ambassador in Paris, and that he loved so much these ‘’ Pommes de terre frites à cru en petites tranches’’ , according to his own manuscripts, that he brought the recipe back to Washington. My favorite explanation is that during World War One, several battalions of American, British, and Canadian soldiers fought in the Belgian region of Yser, in French-speaking western Flanders. This is where they discovered fried potatoes. And since the locals spoke French in that specific area, when the soldiers brought the recipe back home they naturally called them French Fries because they were told in French how to prepare them. I was told that ''Hopleaf'', a Belgian gastropub at 5140 N. Clark Street, Tel: 773-334-9851, that sells more than 100 different Belgian beers, makes very good traditional frites in the "Belgian style". But I have never been there myself. At the 4 star EVEREST, one Financial Place Chicago, Tel: 312-663-8920, famous Alsatian-born chef Jean Joho told me that when from time to time he has a "côte de boeuf'' on the menu he serves it with pommes-frites fried in clarified butter ... Must be something extra special. Kiki’s Bistro, 900 N Franklin St. Chicago, IL Tel: 312-335-5454 serves deliciously crunchy “pommes pailles” with its steak. They are very tiny but fresh cut and fried in two baths. Le Café des Architectes, in the Sofitel Hotel, 20 E. Chestnut St Chicago, IL , Tel: 312-324-4000 makes good hand-cut “matchsticks” fried in one bath.